Hi everyone I'm Jack Red, I figured since I been reviewing movies from my first custom DVD horror movie collection. I should go the full distance to review all the remaining movies. Now I can't stress this enough please stop & take as many breaks necessary. I really don't want you to end up in an hospital or worse over this. To help speed things up I will be linking related blogs where I reviewed a few series included in The Killer Klowns Kollection. Amusement acts sorta like an anthology movie. Each story does connect to each other during the final portion. The first three explains how the killer called The Laugh by people kidnaps them. Sadly only of them the killer dresses in this creepy clown costume. This guy takes on several disguises in most stories. Some parts of the movie are interesting for different reasons. Like the scene where he tricks the guy to listen not knowing it was a trap about to go off killing him. This movie quickly loses it's appeal & never recovers from that. It's difficult for me to even kill this a killer clown movie. It is unknown if the body found in that portion was done while in the clown costume or not. It's funny right? Nope it really isn't man. To put this as simply as I could. There's way more entertaining killer clowns in this collection. This movie felt incomplete it clearly needed more before getting release. I am aware the movie company behind it was going out of business. They should've canceled it. You can also watch Clown on Netflix. Even one of it's producers had the perfect way of describing this movie. It is similar to The Fly remake with a man becoming a demonic clown like creature. Clown centers about a family man that gets a call about the clown isn't coming to his son's birthday party. He looks around for anything similar until he comes across a mysterious chest. Which he opens it up to wear the clown costume inside. A clown suddenly shows up at his son's birthday party making him very happy. Unfortunately the guy finds out he can't remove anything he put on. Trust me he really tries to get it off. You find out later it wasn't a costume he put on, it actually was the demon's skin. Over time parts of him becomes more like the creature. The very idea of clowns seems to be originated from this creature. His hunger of five children over the months of winter. There is technically two ways to free someone from this demon. Clown is a different kind of horror movie. At first we felt very sorry for this guy. Near the end, the demon took over suddenly the feeling changes. Now we want it to get stopped from devouring his child. This isn't a kill heavy movie like some killer clown movies. Surprisingly some gory deaths for kids & I should mention a possessed dog gets his head cut off. This is a movie I recommend not watching in front of your kids. I got a lot of positive things to say about this movie. One interesting fact this cover above scared a lot of people in Italy. This is a very different kind of killer clown movie. We have a man who never officially worked as a clown force to become a demon. Dead Clowns is possibly the worst killer clown movie in the entire collection. Everything about it is so bad that even other bad killer clown movies have more positive things going for them. The closest thing I can say of being positive is some zombie clowns do look good. The audio isn't properly leveled as shown in several scenes. This movie sorta rips off The Fog please allow me to explain. Both of them involves mysterious weather. It was a fog filled with ghost pirates in The Fog. But here we have a fierce hurricane with zombie clowns devouring people. It so happens this events took place on a huge anniversary of the tragedies. I should mention how stupid the ending is. One of the few characters left wrote on a very large piece of paper saying you will be remembered. However since it was simply put out there without any kind of protection. This paper quickly gets damaged in the hurricane. For a short while the zombie clowns were gone until that paper got ruined. They come right back to finish killing everyone. Are you kidding me is this the best you guys could do? I seen Stitches which also involves a zombie clown that's way better than this. There isn't any part of the movie that stands out in a good way. Dead Clowns is a movie I would say highly avoid at all costs. This is more of a cult classic horror movie than anything else. Believe it or not, I like this movie a lot. It sorta reminds me of Twisted Metal's Sweet Tooth since they're food based killer clowns. Sure Horny the Clown isn't a good name but the actual character stands out in so many ways. A lot of people originally didn't like his mask, I felt it does make him stand out more. Horny is mostly killing random people with his over sized cleaver. He also wants revenge for what happened to him relating to someone's mom & friends. Horny has some of the best lines within a killer clown movie. This guy is very entertaining to watch in my opinion. I do enjoy most kill scenes especially stuff you won't expect he does to people. Like putting someone's head in a microwave cooking them to death by causing their head to explode. Sure there is one particular part where the music was too loud but still a good chase scene. Drive-Thru does a great job pulling you in. I would say one of my favorite gem killer clown movies to date. Horny doesn't hold back in killing people. The Funhouse isn't technically a killer clown movie but still a great one. I am a huge fan of the covers with the clown figure. Although that clown doesn't appear anywhere in the movie. I should mention there is a related book explaining more about the story. This follows a group of teenagers that gets mix in with some of the carnival's employees' business. The main killer is actually a freak with extra parts to his face. This movie sorta reminds me of The Texas Chainsaw Massacre due to some of the similarities. I should mention Tobe Hooper directed the first two Texas Chainsaw Massacre movies also directed this movie. Not a lot of people would enjoy this since it plays more of the suspense than flat out killing people of my generation. The Funhouse is a solid classic that more people need to watch. This movie deserves a lot of respect for what it goes. There isn't a lot of good horror movies centered around carnivals or haunted house rides. I felt every scene works better than you expect to. Most kills in the actual movie do the job well enough to satisfy you. This movie has a very big body count. Robert Englund being the warden of this mental facility was brilliant. Six psychopaths came up with a plan to kill as many people they can in one night. Let's just say one of them that wasn't captured pulled some strings for this cause. Two killer clowns among a good variety of crazy people. Each one has a rather disturbing story to tell. Some worse than others like Rocco the Clown is hands down. One of the most violent killer clowns I have ever seen in an movie. This guy doesn't hold back slaughtering people at all even being gunned down several times. This movie was ambitious enough to easily fail but instead we ended up getting a very solid horror movie. Just imagine going to a fun house to turn out some maniacs took it over. A common theme within Dead Rising series. This is a movie if you have a light stomach because it gets very gory & bloody. The kind of violence even censored it down wouldn't keep a lot of it out. The Funhouse Massacre is one of those more recent horror movies to prove me wrong. Obviously there's a couple of movies based on the story of John Wayne Gacy. One of the most notorious real life serial killers with a high body count in history. Of course I needed a movie based on the real life killer clown himself in my collection. I should say I do feel sorry for anyone affected by Gacy's murders. This movie does cover a great deal of Gacy's life. I felt parts of the story are a mix but most important parts works fine. Gacy isn't essentially a horror movie like some movies based on other serial killers. Yes Gacy does kill people during the course of it. The entire point was to display what led to Gacy doing those things. Gacy is a movie not many people would enjoy for many reasons. In fact I'm sure there are better Gacy movies out there. I will say doing the classic clown make up does work in this movie. He spent most of the movie outside his clown costume. The movie does play out very similar to how it did in real life with his arrest. One of the director's first movies actually putting two of his earlier short movies into this movie. One of which just came it's own movie that I do recommend. This is an anthology movie that's sorta went under the radar a little bit. If you seen my review of it's sequel then you already know to avoid that movie. All Hallow's Eve centers mostly around Art the Clown & a baby sitter watching over two kids. WOW Art the Clown really steals the show. One of the absolute creepiest killer clowns I have ever seen. Surprisingly there is a connection to all of these stories. One mysterious VHS tape covers all stories including the wrap around story. Most newer people won't be familiar with VHS tapes. I grew up heavily around those VHS tapes until DVDs quickly became the new thing. Now some might see that VHS tape being a reference to The Ring series. Except if you watch that tape you will have seven days before the ghost kills you. Here just playing it puts you in danger of being killed by whatever comes from the tape. This movie is a strange mixture of things but for being an anthology I thought it works good enough. All Hallow's Eve is itself a play on Halloween since it takes place on that holiday. Trust me it does plenty to differ itself from the long standing Halloween series. Which my brother is a huge fan of those movies. Clownhouse was made by the director behind Jeepers Creepers series. This was his first horror movie before going to prison. It turns out the youngest boy had terrible things happened to him by the director. Sadly this controversiality heavily over shadows anything about the movie. I do agree it is very upsetting this happened during the making of the movie. Mostly due to that, all releases are very limited making finding an official release difficult. You are more likely to get a homebrew DVD instead. 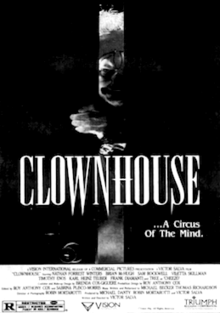 Clownhouse keeps quickly losing the copyrights. The movie centers around three boys that goes to a circus. Later that night, three maniacs broke out of an asylum to kill this circus' clowns. They stolen their clown identities to start stalking these boys. It so happens the youngest among them has a fear of clowns. Believe it or not, this fear is one of the most common among people. Personally I enjoyed clowns while my brother doesn't like being around them. Clownhouse is a somewhat forgotten classic that more people need to watch. 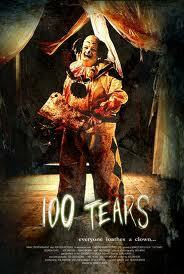 100 Tears follows a circus clown wrongly accused of crimes he didn't commit. Which led to him going insane become a killer. I am not going to lie for a low budget movie, they sure don't hold back on the gore level. Gurdy the Clown steals the show despite not talking or laughing much. This guy has a over sized clever using it like Jason using his machete I'm not kidding. Later on, he gets his daughter in on the action. She acts like this movie's Harley Quinn similar to Dollface in The Funhouse Massacre. This movie sure does have some audio issues especially one scenes most critics points out. The story itself isn't interesting I felt they could've taken a different direction. This movie really isn't for those with light stomach, trust me the gore is over whelming. On unrated version you get extra scenes including an alternate ending. I felt this movie does deliver in most areas horror movie fans would look for. This is sorta a forgotten gem more people need to check out. 100 Tears is a movie you shouldn't over look for many reasons. My favorite killer clown movie of all time. Killer Klowns from Outer Space is one of those movies no one attempted or could recreate. Yes it does have some similarities with The Blob but it's stands more on it's own. The movie centers heavily around these aliens that looks like clowns killing people. This may have the highest body count of any killer clown movie ever made. I am such a fan of this movie that I made sure one of the front covers got to be The Killer Klowns Kollection's front cover. This movie has a huge fan base still going strong to this day. A very unique take of several concepts. Honestly I never seen any killer clowns more evil & wicked as these creatures. Killer Klowns from Outer Space has such a good theme song. Even for a low budget movie, a lot of people are really impressed by it including myself. I would go as far to say this is the perfect killer clown movie. Sure it doesn't have much blood like people from my generation can't get enough. What it does have is a huge body count. This movie has so many killer clowns it's ridiculous. Oh ok not as ridiculous as their arsenal of weapons. Trust me I could describe them all in full detail to make this already lengthy blog much longer. This is a movie that not only stands the test of time but always becomes rewatchable. I honestly could watch an all day marathon of this movie I'm not kidding it's that good. A lot of people who worked on some Friday the 13th movies made this. Originally going to be called April Fools Day but they didn't want to cause problems with another horror movie having that title. They decided to rename it as Slaughter High. This movie sorta reminds me of the first Toxic Avenger movie. Of course there's plenty of revenge horror movies. I would say this is one of the best revenge horror movies I ever seen. Slaughter High does play some Friday the 13th tricks but at the same time brings it's own. This movie is a true classic that more people need to check out. Yes the killer would be a killer clown despite being silence in most kill scenes. Most kill scenes are very well done including stuff I haven't seen in other horror movies. Like this guy drinks a beer with his guts exploding out of him. The ending will freak you out in more ways than one just like some Friday the 13th movies. Slaughter High is technically better than some Friday the 13th movies. Carnival of Souls not to be confused with it's terrible 90s remake is a clever movie. Yes this is a public domain horror movie that people are still talking about today. A very different kind of horror that not a lot of people would like. I can see more older people enjoying it in the right mind set. Carnivals of Souls isn't a killer clown movies but there's a lot of laughter in some parts. This movie is not only standing the test of time but still inspiring people. This was a low budget movie made quickly on a few locations. Originally the director had experience with educational videos. He was on a vacation then he noticed a particular place that inspired this place. Carnivals of Souls is a true classic that more people should watch. I would say a very different kind of horror movie. The entire point of it makes you view things very differently. You finally get to see what exactly happened earlier in the movie. Which was done very well for it's time. There isn't a horror movie centered around killing people. It is more centered around how you view the world around you alive or dead. A follow up to House of 1000 Corpses. Rob Zombie really delivered one of the possibly greatest horror movie sequels I have ever seen. 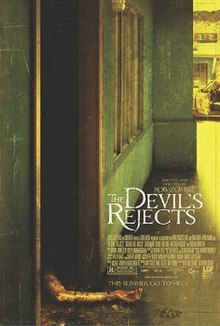 The Devil's Rejects is a very different tone from the original. At the same time, it does an amazing job having the killers shining. This movie is in all honestly a very good in every sense of the word. More recently, they confirmed 3 from Hell being the new entry. The firefly family was heavily inspired by The Texas Chainsaw Massacre movies. The same movies to also inspired The Bakers in Resident Evil VII. I felt The Devil's Rejects did the concept the most justice. There is a lot of people that die in this movie. Unfortunately this was the actor playing Tiny last movie before he died. I felt he gave us a great final performance. This movie improves over most things done in the previous movie. I also felt this did a better job showing off Captain Spaulding. Yes he had more entertaining scenes in House of 1000 Corpses but he gave us a great performance in this movie. Krampus was still new to having horror movie based on him. Most of them are very bad movies. 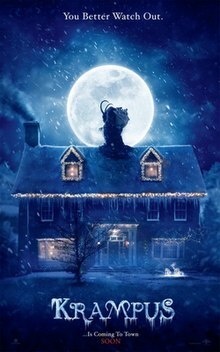 Thankfully there are some good Krampus movies like this one by Universal. This is technically a very different Christmas horror movie. Despite some scenes it isn't focus on killing people. It is more focus around how one kid losing the Christmas spirit affected everyone around him. Which led to him summoning the Christmas demon causing all kind of hell. Do I even need to say who my favorite character is? Der Klown is sorta a reference to Full Moon's Jack Attack. He ends up doing more damage in the long run. Universal did such an interesting on a twisted Christmas experience. The grand mother had prior experience with Krampus doing what she can to help. The animated story is easily one of the best moments of Krampus. Although I wasn't crazy about Krampus' design it still does it's job. This movie can play towards several kind of fears. Krampus is truly a Christmas horror classic more family could enjoy. My bonus killer clown movie is last but it sure packs a lot of puns lol. 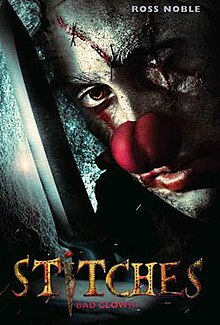 Stitches is also currently on Netflix. The story centers around Tom's birthday party where he & his friends did pranks on Stitches. The last prank went horribly wrong that led to his death. Tom went to a cemetery to be found by a cult of clowns with a warning. A few years later, Tom arranges a house party for his birthday. Of course most of the ones responsible for what happened to Stitches ends up going to it. Stitches is a rather interesting slasher comedy movie. We have a killer zombie clown capable of doing some ridiculous stuff. Do I even need to say it? Stitches steals the show, most scenes with him are very entertaining. This movie also had an UK comedian Ross Noble playing the character. He clearly had a lot fun doing the character in this movie. OMG that dream sequence in a class room was disturbing. I really enjoyed all the death scenes including Stitches' second death.